Top seeds progressed; in the Men’s Singles event both Germany’s Dimitrij Ovtcharov and Japan’s Tomokazu Harimoto booked quarter-final places following success on Friday 24th August at the Seamaster 2018 ITTF World Tour Czech Open in Olomouc. It was the same in the counterpart Women’s Singles event, as the Japanese duo of Kasumi Ishikawa and Mima Ito posted second round wins. Most notably, in addition, those who had been required to start their quest in the qualification tournament advanced. Impressively Dimitrij Ovtcharov beat Korea Republic’s Park Ganghyeon in five games (11-3, 9-11, 11-5, 11-7, 11-9), in a much closer contest, Tomokasu Harimoto overcame Vladimir Samsonov of Belarus, the no.10 seed (11-7, 7-11, 11-6, 11-13, 11-4, 8-11, 11-5). Not to be upstaged, the 2014 champion, Marcos Freitas was most imposing; the no.4 seed, he accounted for Japan’s Maharu Yoshimura in four straight games (11-9, 11-6, 11-9, 11-8). Likewise, Kasumi Ishikawa overcame colleague Honoka Hashimoto, the no.9 seed (11-7, 11-7, 7-11, 11-6, 9-11, 11-4); Mima Ito ended the hopes of Chinese qualifier, Liu Gaoyang (11-9, 4-11, 11-8, 11-9, 11-5). However, they were not necessarily the names to note; players who had been required to compete in the qualification tournament caught the eye. In the Men’s Singles event, Austria’s Daniel Habesohn beat Kirill Gerassimenko, the no.14 seed (12-10, 8-11, 13-11, 12-10, 11-6); similarly England’s Liam Pitchford and China’s Zheng Peifeng impressed when facing fellow qualifiers. Liam Pitchford beat Zhang Yudong, like Zheng Peifeng from China (11-7, 10-12, 12-14, 7-11, 11-6, 11-6, 11-3); in an equally hard fought contest, Zheng Peifeng ended the hopes of Japan’s Mizuki Oikawa (11-5, 11-8, 5-11, 11-3, 8-11, 8-11, 11-4). Similarly, in the second round of the Women’s Singles competition, Puerto Rico’s Adriana Diaz beat Sweden’s Matilda Ekholm, the no.10 seed (11-5, 11-5, 11-4, 2-11, 3-11, 6-11, 11-5), whilst Germany’s Sabine Winter, ended the hopes of Poland’s Li Qian, the no.11 seed (11-9, 11-2, 11-6, 11-8). Meanwhile, in the contest where qualifiers faced each other, China prevailed. Wu Yang beat colleague Sun Mingyang (11-8, 11-7, 11-3, 11-9): Wen Jia defeated Portugal’s Fu Yu (11-1, 11-6, 11-9, 11-3). Unexpected quarter-finalists but it was in the Women’s Doubles penultimate round that the biggest upsets were witnessed; Japanese hopes thwarted as qualifiers prevailed. Hina Hayata and Miu Hirano, the top seeds, suffered against the combination of Croatia’s Sun Jiayi and Singapore’s Zeng Jian (13-11, 4-11, 11-8, 11-8); Kasumi Ishikawa and Mima Ito, the no.2 seeds, lost to Liu Gaoyang and Chinese colleague, Zhang Rui. Somewhat differently in the Men’s Doubles event; top seeds and defending champions, the partnership formed by Germany’s Patrick Franziska and Denmark’s Jonathan Groth booked their place in the final courtesy of success against the latter’s colleague Anders Lind and Hungary’s Bence Majoros (11-7, 11-9, 11-8). 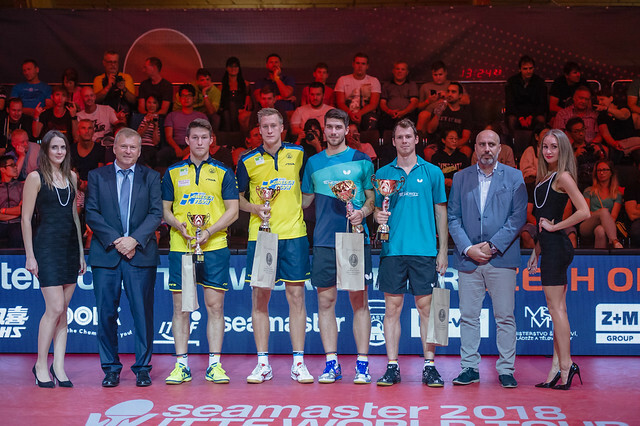 In the final they meet Sweden’s Mattias Falck and Kristian Karlsson, the no.4 seeds; in the penultimate round they overcame Germany’s Ruwen Filus and Ricardo Walther, the no.2 seeds (11-7, 11-8, 12-10). On Saturday 25th August the quarter-finals and semi-finals of both the Men’s Singles and Women’s Singles events will be completed.